The cabinet is the first piece of apparatus to be considered, as it is the principal thing in the work. It is made of galvanized iron piping, five-eighths inch in diameter, arranged as shown in Fig. 1, where the curtains are drawn aside to show the interior construction. There are three horizontal rods running completely around it, and a vertical one in each side besides the corner posts. 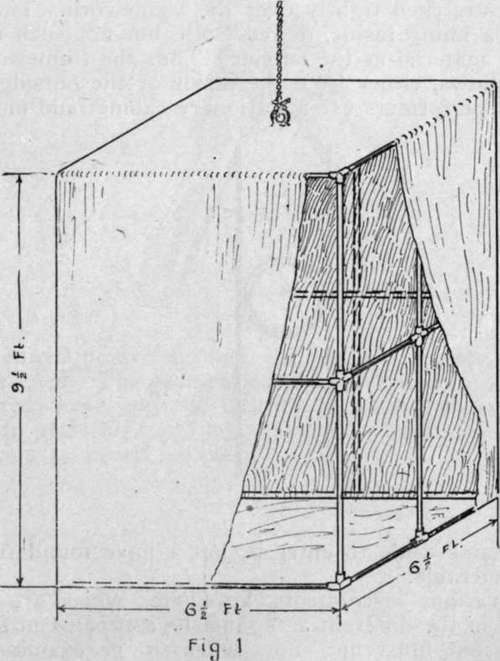 Where the rods intersect at the top there is placed a ring bolt, to which is fastened a rope, dropped from above the stage, so that the whole cabinet can be raised, leaving the stage free. It is only lowered while the escape is being made. The cabinet is open at the bottom, but the sides and top are covered with red velvet, stretched tightly over the framework. There is also a lining inside, of red cloth, but not such expensive material as the outside. Thus the framework never shows, either from the inside or the outside. Some performers use a stationary cabinet and move the curtains aside to enter it, but I have found this kind preferable. The various instruments, keys, etc., which are to be used in the different acts must be concealed in the cabinet, but must not show when it is examined. Therefore they are placed in the horizontal tubing, v. hich is prepared by having the upper side of the tube cut away for a large part of its length, leaving the lower part to form a pocket in which they may be hidden, as shown in Fig 3, and covered by the velvet and the lining. Fig. 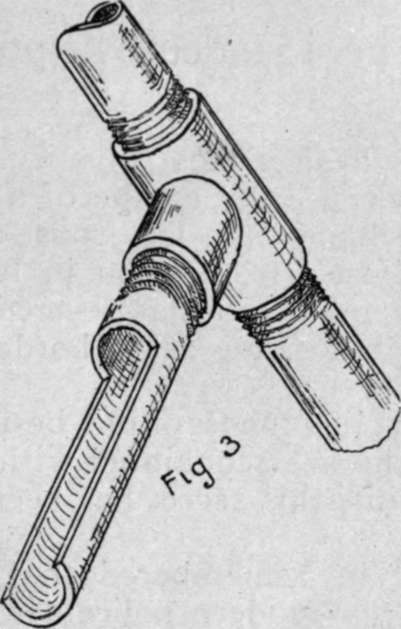 2 shows a section through the rod, with the lower, or solid, part shaded, and cloth on both sides of it. The lining has openings at convenient points through which the keys, etc., may be reached. The performer must, of course, know his different keys and the location of each one, so that he can place his hand on any one instantly, from any position in which he may be placed.